I didn't love Windfall or hate it. The plot will easy to booktalk, and I'm betting this will be a hit in my library. Though the characters are 18-year olds, Windfall's content is fine for middle school libraries. SUMMARY: When Alice gives her best friend (and crush) Teddy a lottery ticket for his 18th birthday, both are shocked when Teddy wins $140 million. REVIEW: If the summary sounds good to you, then you won't be disappointed. This book is exactly what I expected from reading the summary, and I could have predicted the plot pretty closely from the first chapter. No big surprises here, but it is cute and will be easy to booktalk with my library classes. 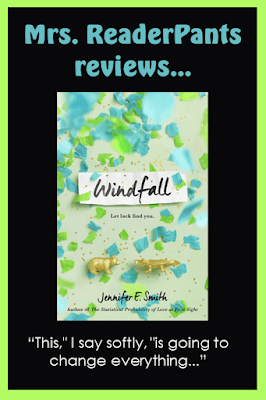 Like Jennifer E. Smith's previous books, Windfall is great for either middle school and high school. I did like the characters, but both Teddy and Alice got on my nerves. Teddy is over-the-top and impulsive and does not follow though on promises (he's a lot like his father, who is addicted to gambling). He brushes Alice off constantly. Is he really that clueless, seriously? Sure, he's 18 and has just won the lottery, but Teddy's impulsive, selfish, showboat behavior is also part of his character. Alice is more practical, and I'm not so sure that she and Teddy are the best match in the long-run. I think five years down the road, Alice will wish she gave sweet, bookish Sawyer more opportunity to sweep her off her feet. Do-gooder Alice comes off as preachy and judgmental about volunteer service. She does loads of volunteer work; we get it. But it does seem a bit overboard to me. Does she have any other hobbies? Sports? Clubs at school? Female friends? If she's planning to go to Stanford, she must study a lot and be serious about school. But WHEN does she do this? With its 5% acceptance rate, Stanford is one of the most selective universities in the USA. If she plans to go there, Alice must be among the very top students in her class, if not the valedictorian. School should be a major priority for Alice, yet the only project discussed in the book is her physics boat project. Considering all the time she spends with Teddy and volunteering, when on earth does she study? I appreciate the attention given to gambling addiction and how it destroys families. Teddy's father needs help, and I liked the hopeful, yet uncertain, conclusion to his story. THE BOTTOM LINE: Despite my annoyance with the protagonists, I know Windfall will be popular and easy to booktalk. It will make a cute movie, too! STATUS IN MY LIBRARY: Ordered and expecting it any day. Language: I don't remember any profanity at all.